Rogaine is the only topical medication approved by the Food and Drug Administration for hair regrowth. It comes in versions marketed separately to men and women, as well as an extra-strength version. The only difference between the basic men's and women's formulations is in their packaging, but the extra-strength version has more of the active ingredient and is FDA-approved for use by men only. The active ingredient in Rogaine, minoxidil, was originally developed as an oral medication to treat high blood pressure, but a side effect appeared during human testing: Test subjects were reporting new body hair growth. Further research led to the introduction in 1988 of Rogaine as a prescription treatment for men with pattern baldness. In 1992, the FDA approved Rogaine for use by women with a prescription. Both versions became available without a prescription in 1996. The men's extra-strength version went on sale in 1997, also without a prescription. The basic products, now called Men's Rogaine and Women's Rogaine, have an identical formulation: 2 percent minoxidil in a solution of 60 percent alcohol, 20 percent propylene glycol and 18 percent water. The extra-strength version is a foam made up of 5 percent minoxidil with 30 percent alcohol, 50 percent propylene glycol and 15 percent water. All versions are topical, meaning they are applied directly to the scalp, not taken internally. According to the Bernstein Medical Center for Hair Restoration in New York, tests have found women to be more susceptible to certain side effects of minoxidil, most notably lowered blood pressure, lightheadedness and allergic skin reactions. That's why only the 2 percent concentration is approved for use by women. In addition, the medication can lead to facial hair growth, especially if the medicine runs down the temples or forehead after being applied. This occurs more often with the 5 percent formulation, another reason why women are discouraged from using it. Nevertheless, according to the American Hair Loss Institute, many dermatologists put female patients on the 5 percent version. Such "off-label" use is not illegal; the FDA's men-only approval for extra-strength minoxidil means only that the manufacturer cannot market it to women. The American Hair Loss Institute says minoxidil actually might work better for women than men. It recommends that men first try finasteride, an oral medication sold under the brand name Propecia, before trying Rogaine to treat pattern baldness. Propecia has not been approved for women. 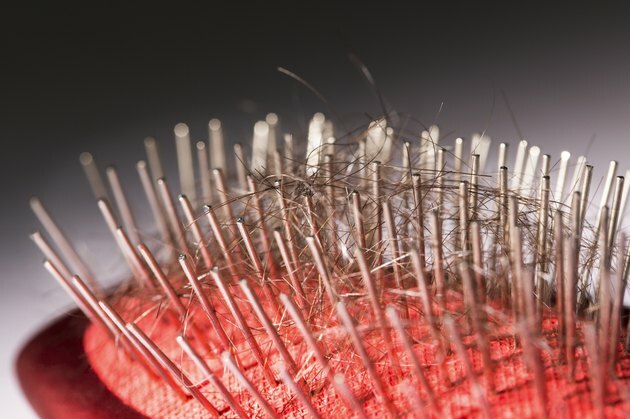 The institute suggests women see a doctor who specializes in hair loss before starting minoxidil treatment. According to the National Library of Medicine, minoxidil is most effective for people under age 40 with pattern baldness whose hair loss is relatively recent and ongoing. It won't help people who have gone completely bald, and it's not effective for people with receding hairlines. The library says that users typically have to use the medicine for four months to a year before seeing any effect, and that the new hair tends to fall out within months of quitting minoxidil treatment.